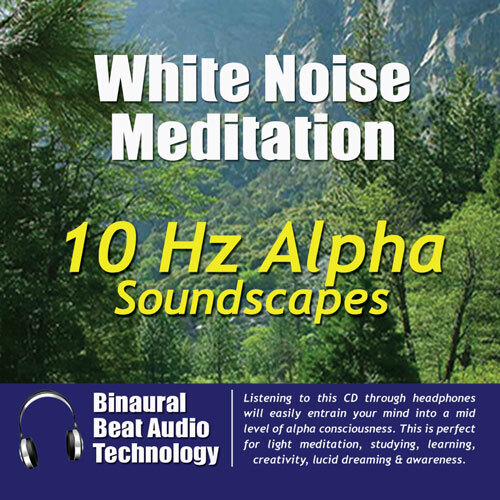 10Hz binaural beats carried through white noise, to achieve exact levels of Alpha trance. Accompanied by light background music, this CD/MP3 will take your mind into a perfect level for enhanced learning, creative abilities and increased focus. The special white noise and binaural beats on this recording are centered around 10 cycles per second (10Hz). This promotes an easy transition into a mid range Alpha brainwave pattern through brainwave entrainment. Enhance creative activities - painting, drawing, writing etc. Also included in the audio mix is an ambient musical soundscape to create a more interesting listening experience. To use the program simply listen through headphones for your desired activity, outcome or purpose. Regular daily use will allow you to experience Alpha brainwave patterns for long term results.